Entering the second day of SEMA, the event is now in full swing as automakers are battling it out to showcase what models have the most versatility. Through added modifications and upgrades, companies like Ford, GM, and Dodge are going full force, creating some of the wildest concept trucks imaginable. Also, thrown into the SEMA mix are a couple of wildly awesome throwback trucks, updated for today’s road. But what trucks have really stood out so far? 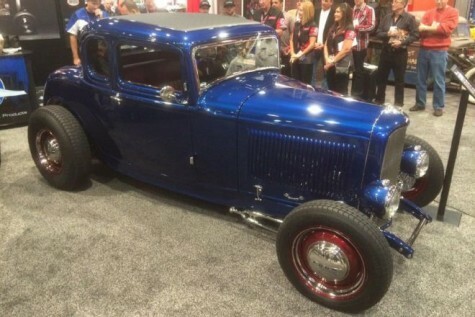 Well, take a look at some of the best trucks from SEMA 2014 below. 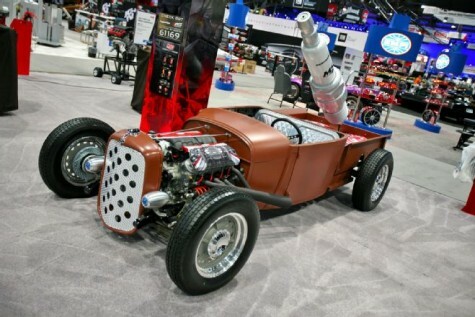 Passing by booth 61169, this rat rod immediately caught my eye. The truck looks to feature elements of a classic Ford, but it has been modified so much that is pretty hard to tell. Overall, I love the the ride, but I do have one complaint: where’s the rust? A rat rods got to have rust, right? Some Ford fans may be lamenting over the fact that a new Ford Raptor won’t be rolled out in 2015. But they shouldn’t! The all-new aluminum bodied F-150 SuperCrew has been designed to fill that void, that is until a new re-incarnation of the Raptor is birthed. Custom body panels (flared fenders on the front and rear), upgraded bumpers and sidekicks, a chase rack, folding lightbar, and a Baja Chase Organizer for tools, spare tires, etc. This highboy five-window coupe was put together by the crew at Roy Brizio Street Rods in San Francisco, California. This throwback beast has an unbelievably elegant interior and it is powered by a mind-numbing Edelbrock- Ford Boss 427 bent eight. Somebody fan me down because I’m sweating like a pig! In a collaboration with Brian Deegan (the most decorated Freestyle Motocross rider in X Games history), Ford showcased the Deegan 38 concept. This bad boy is another variation of the all-new aluminum 2015 F-150, which Ford has obviously been pushing hard all week. This ride boasts a set of Mickey Thompson tires and wheels, Fox Racing Shox, and a premium 10-speaker Rockford Fosgate sound system. Underneath the hood, Ford went with their base 3.5-liter EcoBoost V6 engine, which will crank out 365 horsepower and 420 lb-ft of torque. These bad boys were originally produced from 1956 to 1965, with Jeep only selling about 30,000 units during that time. Because of these sub-standard sales, Jeep pulled the model and shelved it permanently. The rarity of this ride makes it a definite gem here at SEMA. These particular models on display are said to be powered by a late Hemi and were put together by the good people at Daystar. Set to race in the Baja 1000, this truck is Toyota’s attempt to showcase just how powerful and durable their products can be 0n the off-road scene. To enhance the performance further, this truck is fitted with TRD wheels and 37 inch KR Baja T/A race tires. 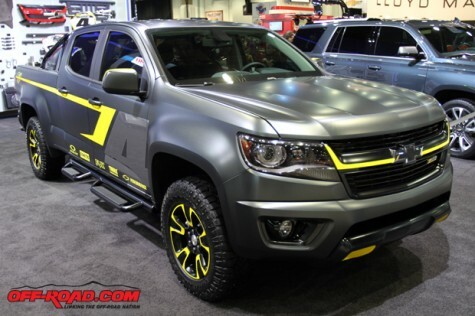 This entry was posted in Autoshows, Culture and tagged SEMA, SEMA 2014, trucks. Bookmark the permalink.